LAST year, the top 50 cooperatives accounted for 79 percent of the 195.2 billion pounds of milk marketed in the U.S. The top five cooperatives handled 54 percent of the milk marketed by the top 50 and they handled 43 percent of the entire nation’s milk. The top 50 had 38,462 member farms which represented a 5.1 percent drop from a year ago. This was a greater decline than the drop in overall number of licensed U.S. dairies in 2011 which went from 53,132 farms to 51,481. Despite this fall in farm numbers, total milk production from the top 50 list rose 1.9 billion pounds. This 1.2 percent rise is a slightly smaller climb than the 1.7 percent change in the national total of milk marketed in 2011. 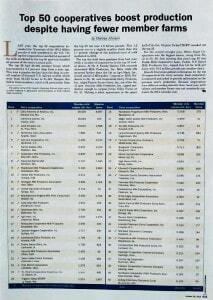 The top five held their positions from last year, while a number of cooperatives in the top 25 traded places. At No. 6, Family Dairies USA overtook Associated Milk Producers, Inc. More trade offs occurred further down the list as Agri-Mark, Inc., moved ahead of Milwaukee Cooperative Milk Producers to No. 16, and Continental Dairy Products, Inc., edged Prairie Farms Dairy, Inc., out of the No. 19 spot. Security Milk Producers, Inc., upped production enough to surpass Swiss Valley Farms at No. 21. Making a debut appearance in the upper half of the list, Organic Valley/CROPP rounded out the top 25. 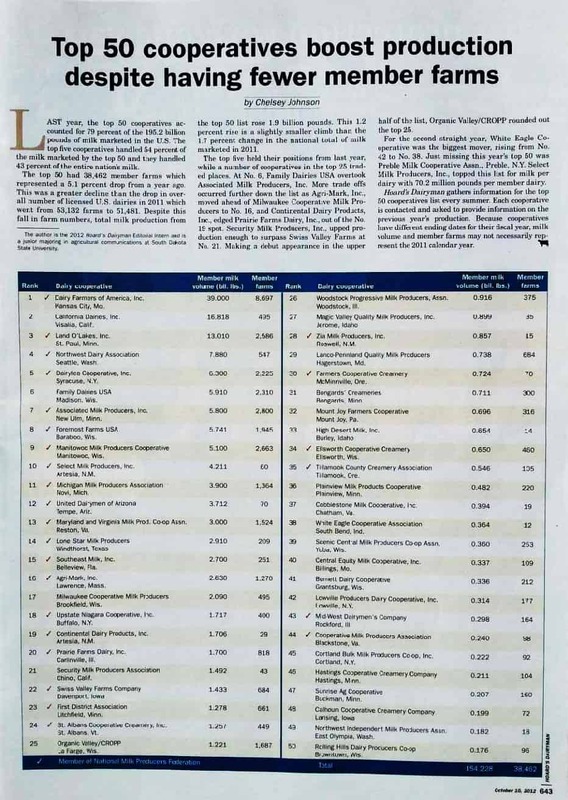 For the second straight year, White Eagle Cooperative was the biggest mover, rising from No. 42 to No. 38. Just missing this year’s top 50 was Preble Milk Cooperative Assn., Preble, N.Y. Select Milk Producers, Inc., topped this list for milk per dairy with 70.2 million pounds per member dairy. 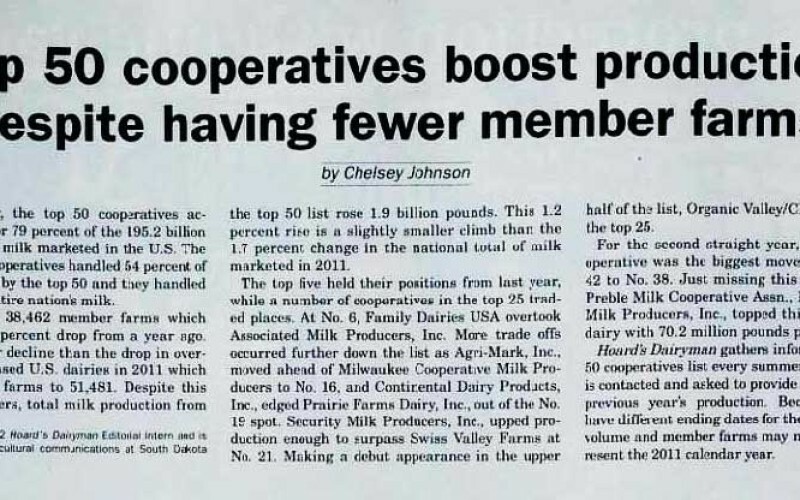 Hoard’s Dairyman gathers information for the top 50 cooperatives list every summer. Each cooperative is contacted and asked to provide information on the previous year’s production. Because cooperatives have different ending dates for their fiscal year, milk volume and member farms may not necessarily represent the 2011 calendar year.